Nico Muhly: <i>A Good Understanding</i> available Now! 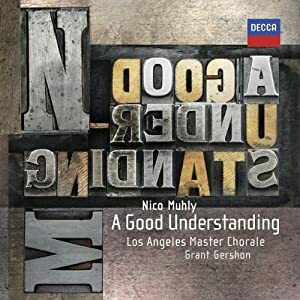 Decca's first release with the Grammy-nominated Los Angeles Master Chorale under music director Grant Gershon features performances of Nico Muhly's choral works in A Good Understanding. Nico Muhly, "the planet's hottest composer" (The Daily Telegraph), finds his greatest pleasure in life is writing choral music and his brilliance definitely shines through in his work! Also available is Nico's second Decca release, I Drink the Air Before Me.